Just one new three double bedroom chalet bungalow remains available at Valeside Keep, Burgess Hill - an exclusive development of just 29 homes. The chalet bungalow features a ground floor master bedroom suite and a private south facing rear garden. A recent buyer at Valeside Keep shares their story below - having relocated from outer London, Mr and Mrs Chapman are delighted with their new Thakeham bungalow. “We have been looking for our perfect home for years. Downsizing at our stage in life meant we knew this would be our last move - so it needed to be right. We’d viewed lots of properties but none were quite right. Having seen a local property advert for Valeside Keep in Burgess Hill, we decided to arrange a visit. “Immediately we felt that we’d found something special. We were hugely impressed by the quality, the workmanship and the materials used by Thakeham. “During our search, we’d realised that new, attractive bungalows are extremely hard to come by. We’d decided we wanted a new home because we didn’t want the extra work of DIY and home improvements. We needed easy parking for us and visitors, a garden that was easy to maintain, and location was important to us too - we wanted to be close to family. “Our new Thakeham home has all of this and more, and everyone who has come to visit has loved it! To arrange a viewing of the final new chalet bungalow at Valeside Keep, please contact our Burgess Hill team on 01444 235665. 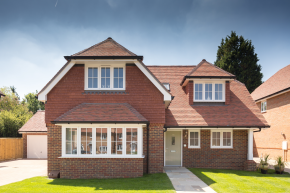 Mansell McTaggart’s local team has supported the developer, Thakeham, in both the site acquisition and the sale of their new homes at Valeside Keep in Burgess Hill.